There are glorious views of Dartmoor National Park from this lovely Devon campsite. Fabulous views and numerous walking and cycling opportunities await those camping at our lovely Tavistock Club Site. This pretty site lies on the central western boundary of the stunning Dartmoor National Park. This spacious campsite accommodates up to 75 units and has modern facilities including individual shower rooms with toilet and sink, disabled facilities and a laundry and washing up area. As well as the many dog walking opportunities off-site, there are two large enclosed dog walks on site. Tavistock, two and a half miles from the site, has world heritage status. It is a picturesque and ancient market town with the beautiful River Tavy running through its centre. Whether you enjoy lovely cafes and shops or grand architecture and historical abbey ruins, it is well worth a visit. Leave your car on site and venture out on foot or two wheels and explore Dartmoor’s sweeping hills and wooded valleys. The National Cycle Route number 27 (coast to coast Ilfracombe to Plymouth) passes 200 yards from the site. 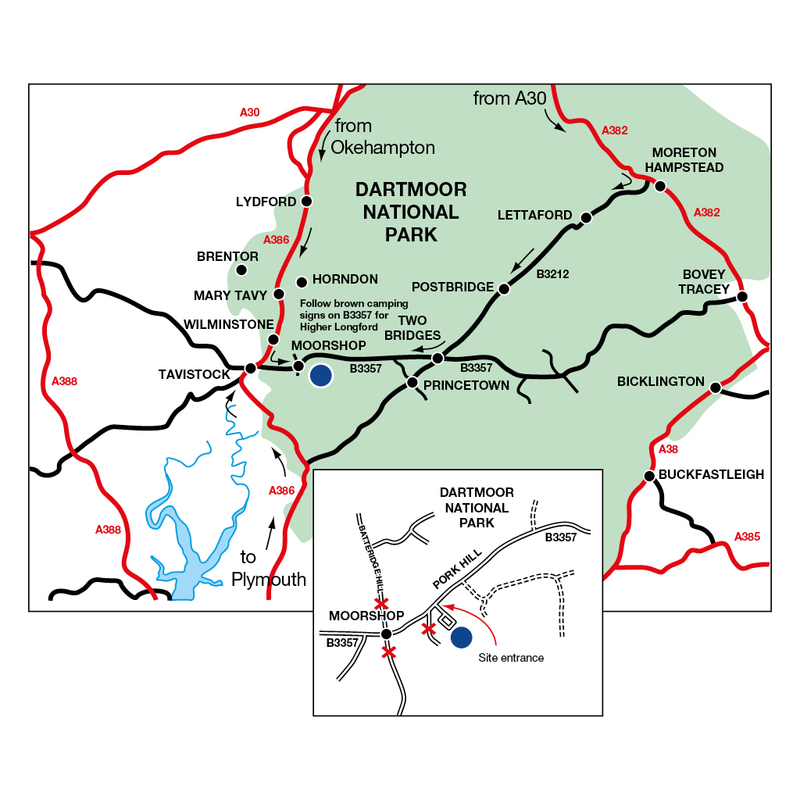 A good place to start your visit to Dartmoor is the National Park Visitor Centre at Princetown, east of Tavistock campsite. Displays and exhibitions give a wonderful insight into the history, culture and wildlife of the area. Princetown also offers excellent access to the north and south moors for hill walkers. The beautiful village of Sheepstor south-east of Tavistock campsite is where Stephen Spielberg’s Warhorse was filmed, while north of the campsite, Lydford boasts a castle and the stunning Lydford Gorge which stretches for one and a half miles from the Devil’s Cauldron whirlpool to the 100ft Whitelady Waterfall. Do not use SatNav due to very narrow local lanes, refer to printable location map. Two great dog walks on site. Large designated play area for ball games. Four holiday cottages available, adjacent to the site, contact 01822 613360. Super service pitches have water and drainage (no TV point). Grass only pitches are not suitable for motorhomes or campervans as they are sloping. Chocks may be required for other unit types. 100% coverage cannot be guaranteed due to rural location, weather conditions and changing flora. These can cause variable signal strength. Hotspots are available. Situated amongst granite boulders on a flat and desolate area of Dartmoor, Foggintor Quarry is an abandoned pit with glistening water at the bottom. Today, it’s used for adventure sports such as rock climbing, wild swimming, abseiling, hiking and scuba diving. Standing isolated atop a hill on the western edge of the Dartmoor National Park, the Church of St Michael de Rupe boasts magnificent views of the Devon countryside. Dating back to the 13th century, the church was once used as a Beacon tower to spread word of approaching enemies. With a spectacular plunge of 30m, Lydford Gorge is the deepest waterfall gorge in the South-West. Stroll along one of the various paths to the gorge and marvel at this natural wonder whilst keeping an eye out for dippers and wagtails. Teeming with wild woodland, overgrown moorland, idyllic hamlets and meandering rivers, the Dartmoor National Park is a diverse landscape in the heart of Devon. Whether you want a relaxing break, or an adrenaline-fuelled adventure, there’s something to do here for the whole family. Camp near the South Devon Heritage Coast for sandy beaches, peace and tranquillity.